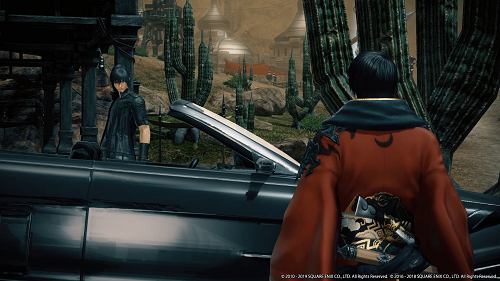 FINAL FANTASY XIV Online Reveals Upcoming FINAL FANTASY XV Collaboration! 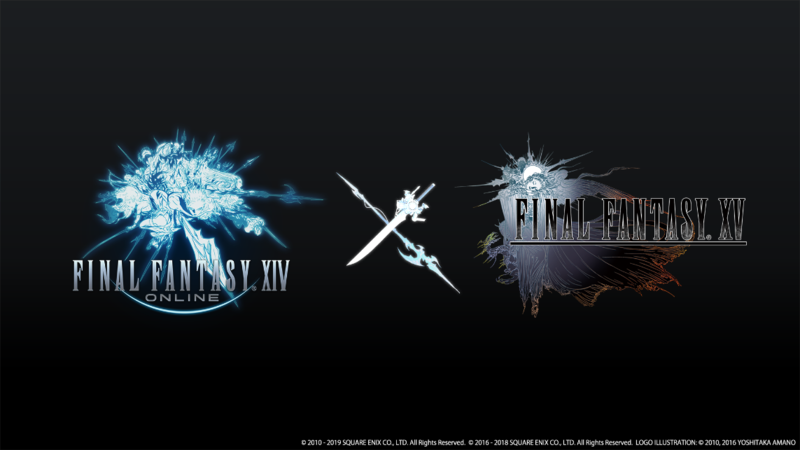 SQUARE ENIX® has revealed its critically-acclaimed MMO FINAL FANTASY® XIV Online is set to feature a crossover event starring familiar faces from the world of FINAL FANTASY XV. 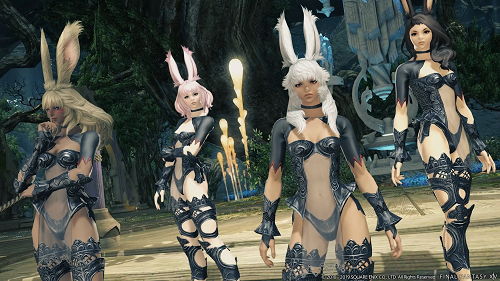 Set to go live in mid-April, the collaboration was announced via a teaser trailer shown as part of the most recent Letter from the Producer LIVE, which took place during the FINAL FANTASY XIV Fan Festival which took place in Paris over the weekend. In it, we see FINAL FANTASY XV hero Noctis Lucis Caelum entering the world of Hydaelyn with the Regalia, where he joins the Warrior of Light in battle against magitek infantry, magitek armor, and even the Messenger, Garuda, hailing from Eos. 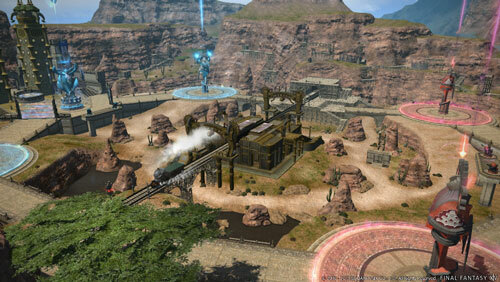 New Rival Wings Map “Hidden Gorge” – The newest campaign in this large-scale 48-man PvP content will feature new mechanics and rules. Two teams will compete to control train stations within the arena to obtain valuable cargo, and best Goblin Mercenaries who roam the battlefield to win their favor and have them fight as an ally. Eureka Hydatos – The fourth and final entry in the Eureka storyline will raise the elemental level cap to 60, add new logos actions and allow gear enhanced in Pyros to be further improved. Those who follow the story to its conclusion will be able to enter The Baldesion Arsenal, an ultra high-end public instanced dungeon for up to 56 players. It’s a challenge not for the faint-hearted! Stormblood Beast Tribe Quests – a new quest series bringing together the Beast Tribes of the last expansion. Dark Knight Figure - An impressive high-quality figure that features the Warrior of Darkness as a dark knight. Shadowbringers Art Book - An art book featuring a wealth of illustrations and concept art used in the creation of the expansion. Shadowbringers Logo Sticker Cling - A reusable vinyl cling featuring the Shadowbringers logo. FINAL FANTASY XIV Playing Cards - A deck of playing cards featuring a range of artwork from A Realm Reborn through Shadowbringers. In-game Grani Mount - Ride the formidable Grani and strike terror into the heart of any foe in your path. Caution is recommended when mounting the rather pointy beast. In-game Wind-up Fran Minion - Take Fran along as your partner in the skies, on land, or under the water. Wherever your adventure takes you, just keep it away from Mist. In-game Revolver Gunbreaker Weapon - Squall's iconic gunblade makes its appearance in FFXIV as a gunbreaker-exclusive weapon. Charge into battle with it…or not. Whatever. In-game Baby Gremlin Minion - There is nothing more invigorating than venturing into unfamiliar lands with a baby gremlin nipping at your heels and bad-mouthing your every move. Aetheryte Earring - An earring modeled after the Aetherytes found in towns across the land. Grants 30% bonus EXP when worn, up to level 70. 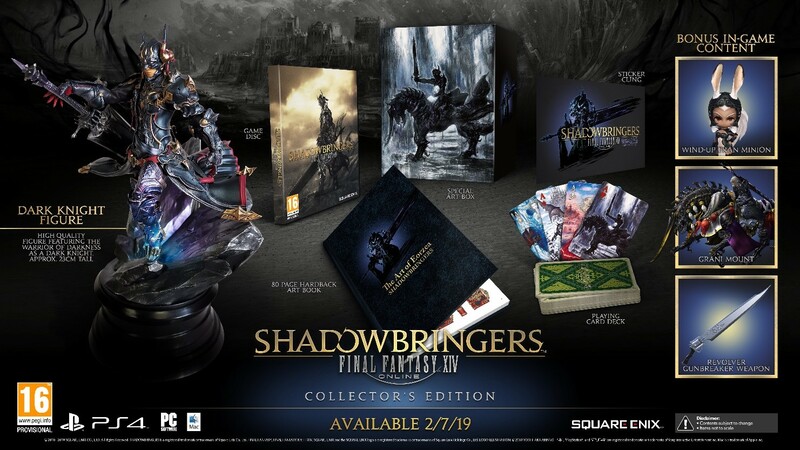 Early Access - Early access grants users the ability to play Shadowbringers on 28th June*, several days before the official release! *Early access start date subject to change. Please note that there is a possibility of maintenance taking place during the early access period.